Built with power, precision and versatility for achieving unmatched capabilities in precision turning. » Rigid rectangular section wide bed. 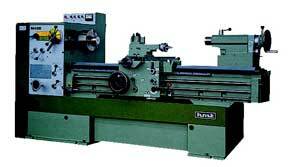 » Short spindle and shafts for maximum drive rigidity. » Straight bed and gap version with removable bridge piece. » All drive gears in headstock are case hardened and ground. » Dry sump lubrication for minimum thermal deformation. » Induction hardened integral guideways on bed.